HiKoo® CoBaSi Multi and Solid, 55% Cotton, 16% Bamboo, 8% Silk, 21% Elastic Nylon; 220 yards / 50 gram hank; 2 hanks in MC (Multi), 1 hank in CC (Solid). 2.5mm (approx. US 1) 40” circular needle for Magic Loop, or circular needles for two-circ method. Note: DPNs can be used in place of circular needles, but the pattern is written for Magic Loop/two-circs. To adjust, simply work ‘Needle 1’ over your #1 and #2 DPNs and ‘Needle 2’ over your #3 and #4 DPNs. 32 sts & 48 rounds = 4” in Stockinette stitch in the round. If you prefer tighter ribbing, use one needle size smaller in those areas. Sock is worked from the ‘toe’ up, even though there is no toe! These socks can be worked two-at-at-time. Just note that you will either need to split the solid color hank into two balls, or pull from the inside and outside of a caked yarn. Week 1 - Cast On for Two-At-A-Time Socks! 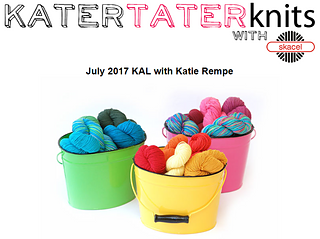 While not required to knit two-at-a-time, this could be a great opportunity to learn if you’re already comfortable with Magic Loop! Week 2 - How to Place the Afterthought Heel! 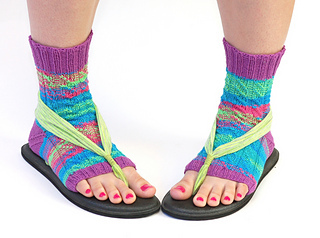 This video includes instruction for one AND two-at-a-time socks! This video will show you how to remove the waste yarn and put your stitches back on the needle to work again!